Bill Gelineau and Angelique Chaiser Thomas appear on the WOOD TV program, "To The Point." Following the August 25 Libertarian Party of Michigan Convention, Governor and Lieutenant Governor candidates Bill Gelineau and Angelique Chaiser Thomas wasted no time hitting the campaign trail. On Thursday, August 30 they traveled to Grand Rapids for interviews with several media outlets. These included a taping of Michigan voters are 'ready for real solutions.' Also they were interviewed by WZZM TV 13 (an ABC affiliate), and WOOD News Radio. They finished their Grand Rapids tour with a pop up reception attended by many of the party faithful at Abacus Title Agency. Bill Gelineau and Angelique Thomas Dallying in Detroit. Detroit, MI - Top of ticket candidates Bill Gelineau and Angelique Thomas continue their state wide campaign with multiple visits to Southeast Michigan. This included spending several hours at Dally in the Alley based in Detroit's Midtown (BKA The Cass Corridor). Bill also had some fun at the Allegan County Fair. This included riding the Libertarian Party of West Michigan Float around. Bill Gelineau rode the LPWM float around at the Allegan Fair with Mary Buzuma folowing on foot. Photo by Arnis Davidsons. By By Connor Jared Nepomuceno, College Outreach Director. Fruitport Township, MI - On Friday October 19th the Fruitport Post of the VFW will host a candidate forum at 5201 Airline Road, Fruitport Township 49444 from 6:00 PM to 7:30 PM. Mary Buzum. Candidate for State Senate. Dist. 30. 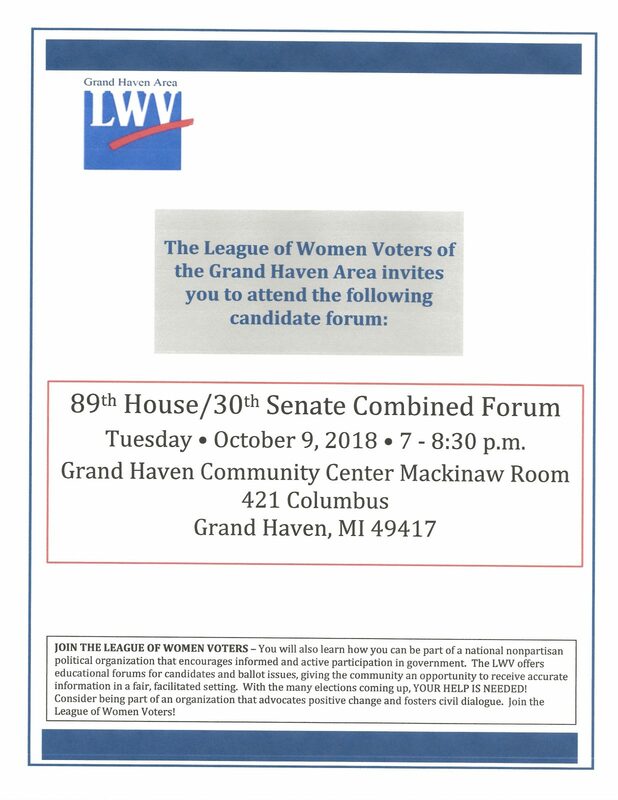 Grand Haven, MI - The League of Women Voters of the Grand Haven Area will be holding a forum on Tuesday October 9th at the Grand Haven Community Center Mackinaw Room, 421 Columbus, Grand Haven Michigan 49417. Candidates for the 89th State House and 30th State Senate Districts will be featured. Please see this flyer for details. Detroit, MI - I plan on campaigning in downtown Detroit, on the campus of Wayne State, in Eastern Market on Saturday mornings and on Sundays before Lions' home games during the tailgating period. Of course, I will also be campaigning in the neighborhoods of Grosse Pointe Shores, Grosse Pointe Woods, Harper Woods and the northeastern parts of Detroit. My short but to the point campaign slogan of "our car insurance is too damn high" is an attention grabber for sure and meets with 100% approval. I have also added a second line, "repeal the no-fault law, vote Libertarian." Livonia, MI - I was pleased to participate in a League of Women Voters candidate forum on September 19th, 2018 at the Livonia City Hall. Approximately 80 people attended the event, and I was able to quite effectively contrast the" Less Government, More Freedom" position against the Democrat who found no tax increase and no new government program to not be of her liking. The Republican candidate did not attend. As submitted by the candidate to the Detroit Free Press and League of Women's Voters. Teacher, social worker postal clerk/ Master 35 yrs. ; union treas. & steward 2 yrs. ; curriculum adviser 6 yrs. ; Downtown Development, chaired subcommittee 1 yr.; advocate for poor (took homeless in) lifetime; fund raiser for charity 15 yrs. ; leadership in civic and religious organizations 53 yrs. ; various occupations from farm work to assembly, bus driver to lifeguard - managed city pool, reading tutor, working with gifted and talented. With a vast field of experience, being able to listen to all sides, do research and find viable solutions are major reasons for running for Trustee and are valuable assets to this work. Received Citizen of the week award and Governor's award for environment improvements. I have lived overseas and in many areas of MI including Romeo, Bad Axe, St. Johns, Interlochen, Traverse City, Lapeer, Rogers City, Allegan and Alanson. MSU Trustees are in the process of hiring a new university president. This person should have varied experience in business and education. This person should be thoroughly vetted and not political. A person who loves to work with students and is available to all with an open door. Handling future sexual scandals and avoiding "cover-ups" is a major issue that still plagues our school. Policies should be in place and enforced to provide a safe environment for all persons; i.e. zero tolerance for sexual harassment, bullying and hazing. We need to be fiscal responsible, accepting and pro peace. Stempfle has a number of upcoming speaking engagements scheduled. He will address the Oakland County Clerk's Association on September 26 about election reform, the Metropolitan Organizing Strategy Enabling Strength (MOSES) about voting rights for former prisoners on October 2, and will participate in a meet and greet hosted by CitizenDetroit on October 4th. Since getting the nomination, Stempfle has also been interviewed with the Detroit News, the Tom Sumner show in Flint, and by the Oakland County Times. Romulus, MI - Delegates at the August 25 Libertarian Party of Michigan State Convention voted to oppose Proposal 2. Organized by the group Voters Not Politicians, the proposed amendment to the Michigan Constitution would create an independent citizens redistricting commission designed to curb partisan gerrymandering. Among the reasons for the opposition to the amendment are that it would define "major political party" in the state Constitution for the first time and limit that category to only two political parties, those two with the largest representation in the state legislature. The commission would therefore consist of four Democrat, four Republican, and five "non-affiliated" members, giving the major parties an 8-5 majority. Many libertarians feel that gerrymandering is an inherent characteristic of electing legislative bodies by single member districts and the only way to solve this problem is to move towards electing legislators from multi-member districts or proportional representation. At the same convention, Libertarian delegates took no position on Proposal 1, the ballot initiative organized by the Coalition to Regulate Marijuana Like Alcohol. However at the July 2017 State Convention, delegates fell two votes shy of the two-thirds necessary for the endorsement. Most of the opposition to the proposal was because people with previous cannabis convictions would not have their record expunged (something Bill Gelineau has promised to do if elected Governor) and the additional taxes placed on cannabis being used as a means for government to raise revenue for unrelated functions. Allegan, MI - From September 7th through 15th, Libertarians worked the Allegan County Fair Booth. Mary Buzuma of the West Michigan Libertarian Party was volunteer coordinator. Myself and Arnie Davidsons helped work the booth for a whole week. Bruce and Ann Campbell of Allegan also helped as volunteers for a few days as well as many others from the West Michigan and Southwest Michigan Affiliates. We handed out flyers for candidates and the Libertarian Party. Many fair attendees stopped and took the "World's Smallest Political Quiz" and were surprised to find that they were Libertarian. The fair parade on Monday night had the "Lady Liberty" float. Mary and Ann walked the parade route along with our candidate for Governor Bill Gelineau who worked the crowd. The band that marched in front of our float played "My Country 'Tis of Thee, Sweet land of Liberty." You couldn't ask for anything more and for free. Parade watchers clapped as our crew and float passed by them. You'll find Bruce Campbell on the statewide ballot for Trustee of Michigan State University. Mary Buzuma is running for State Senate in District 30 (Ottawa County). Be sure you are registered and vote November 6th! I would like to thank everyone who volunteered at the Libertarian Party of West Michigan's booth at the Allegan County Fair this year and made it our most successful to date. Together we handed out about 600 pieces of literature (mostly the Libertarian Promise to Michigan with Slate Card and Bill Gelineau for Governor tri-fold), gave 100 World's Smallest Political Quizzes and managed to raise a few bucks in the process. Thanks to: Ginger Walto, Jason Brandenburg, Jamie Lewis, Bruce and Ann Campbell, Jake, Rachel and Quinn Andrews, Nick Zientarski, Quinton Smith, John Hanse, Larry Johnson and James Hudler (thanks guys for coming all the way from Washtenaw), Bill Gelineau (the only candidate for governor at the parade) and Lorence Wenke who got "The Lady" to the parade. I have met very few people - in any walk of life, much less the contentious world of political activism - as thoughtful and giving, as considerate and warm-hearted, as Ed Karpinski. I can't recall ever hearing an angry (or even unkind) word pass his lips - about anyone. Rest in peace, my friend. You will be missed. The Libertarian Party, the libertarian movement and, in fact, the world in general is a little poorer for your loss. Edward W. Karpinksi, longtime Libertarian Party of Michigan (LPM) activist passed away on September 8th at age 82. Most veteran Libertarians will remember him as the dedicated volunteer who was always willing to organize bulk mailings at a time when postal delivery was the primary means of communication between the LPM and its members. He and his wife Joanne were always volunteering and would often work together until her death in the fall of 2001. Edward was also on the Board of Directors of the CCW reform organization Brass Roots. Bruce Hoepner of Brass Roots, posted "Sad to hear of this. He was a true gentleman and a stalwart for the Libertarian Party." He rarely if ever missed a Wayne County Affiliate meeting until a little over a year ago. Former Wayne County Chair Raymond Warner commented, "He was a gentleman, and he didn't need to be reminded when there was a meeting." Edward was a life member who didn't use the internet. Sometimes he got printouts of the online Michigan Libertarian mailed to him. In recent years he would often learn of LPM events by phone or word of mouth. Ironically, the Michigan Libertarian learned of his passing from an online death notice. Nancy O'Brien had spotted this notice for "Albert" Karpinski, and brought it to the attention of editor, Scotty Boman. According to his son, the difference in first name was purely a misprint. Boman who attended the memorial on September 12th said, "I had met some of his family at Joanne's funeral in 2001, but had forgotten that he had four daughters and three sons. He was also a grandfather. While most Libertarians will only know of Joanne, he was previously married to Beverly. In recent years he was with his significant other, Yvette Reghi." Boman had also known Edward from outside the party, "He and Joanne were active members of Unity Church of Today where my late mother was also a member." Most people will remember Edward for his kind manners as described in the opening quote from Tim O'Brien. Tim's wife Nancy noted, "Ed was a sweet guy, a kind and unassuming man - I can only remember good things about him." This sentiment was echoed by others on social media. Barb Vozenilek, who was county coordinator for the 1994 ballot access effort, posted, "I so remember Ed, so sweet, helpful and absolutely authentic. He will be missed." Detroit, MI - Scotty Boman is the Libertarian candidate for Michigan Board of Education, but that hasn't taken him away from local politics. He is also founder of Detroit Residents Advancing Civilian Oversight (D.R.A.C.O.). He appears to have been unsuccessful in preventing the Charter Revision (Proposal R) from passing, but he hasn't given up on his mission to preserve the Detroit Board of Police Commissioners (BOPC). "We want the public to make informed decisions. If more people were aware of Proposal R, we wouldn't be having this conversation, but some DCC candidates have already come out in favor of preserving or even expanding on, the elected BOPC. DRACO is an educational organization, and we want to make sure voters know which DCC candidates support civilian oversight and the right of Detroiters to elect their own Police Commissioners. Boman isn't convinced that the Proposal R (the ballot question that opened the Charter for revision) passed in a fair election. He and two other Detroit residents, Gregg Newsom and Lucinda Darrah, successfully petitioned for a recount of some Detroit precincts. On September 6th they attempted to recount 65 of Detroit's 503 precincts, but were only able to recount 61 of them. The measure had reportedly won by 184 votes, but the challenges were able lower that difference to 173. However a much larger number of votes could not be recounted. Four precincts were said to be "uncountable." The number of ballots in those precincts was 520, much larger than the difference between "Yes" and "No" votes. Michigan election law allows results to stand when discrepancies between log books, machine counts, or the physical number of ballots renders a precinct "uncountable." In one case, two precincts that were stored in the same "sealed" ballot box were missing 38 of the ballots that were on record as having been placed in the box. In spite of irregularities many times as serious as those needed to change the outcome of the election, the Wayne County board of canvassers upheld the results without organizing an investigation into the cause of the irregularities or how those irregularities could affect the outcome of the election. In so doing they have usurped the right of the people to approve or disapprove of the charter since a true and proper result cannot be determined as the number of uncountable ballots will change the outcome and result. Grand Haven Community Center Mackinaw Room, 421 Columbus, Grand Haven Michigan 49417. The emphasis will be on the future of civilian oversight of law enforcement. For more information contact Lt. Colonel (Ret) Max Riekse, Fruitport Post Commander at (231) 865-3238.